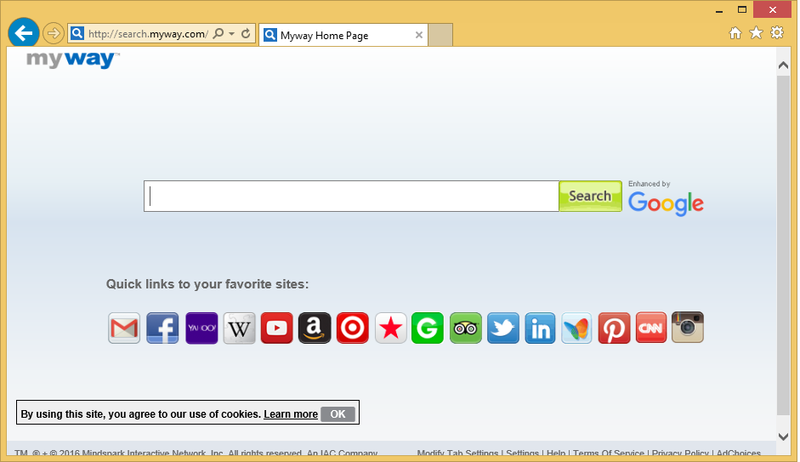 Myway is an unreliable website that is associated with an advertising-supported application called search.myway.com. If you get redirected to this site on a daily basis or if it has become your home page without your knowledge, it means that you have the adware on your computer. It is possible that you acquired it by accident when installing other software. You should not be worried as potentially unwanted apps tend to be harmless, however, they are also known to cause unnecessary modifications and expose users to unsafe online data. There is no question that you should get rid of Myway related program as soon as you can. As it has been mentioned above, the adware travels in free software bundles. The bundling method allows potentially unwanted apps to enter the system without the user’s notice. They can be avoided, however, if you pay careful attention to the installation process of the freeware that you download. Make sure that you always choose the Advanced installation mode and deselect all components that are optional. We assure you, you will not be missing out on anything. Instead, you will be keeping your system adware-free. The main symptom of the ad-supported application is that it floods your browsers with various advertisements including pop-ups, banners, links, coupons, pop-unders, etc. The commercial data will appear on all sites that you visit regardless of whether they have anything to do with online shopping or not. What you should know about the ads is that they are not checked by anyone, so they can be fake. Clicking on them is your own responsibility. We urge you against that as you could end up on corrupted pages and fall for online scams. This may result in serious troubles like malware infection, data corruption, money losses, and so on. If you wish to avoid these outcomes, you should not hesitate to delete Myway. You can terminate Myway redirects by uninstalling the program that causes them. There are two Myway removal options that you can choose from: manual or automatic. We recommend the second one as it is more beneficial. If you implement the anti-malware from our website, you will be able to erase Myway along with other unwanted components. The security tool will perform a full system scan, detect all unsafe files and programs, and eliminates them. In addition to that, the software will stay useful in the future by providing your PC with real-time online protection and other valuable features. Alternatively, you can uninstall Myway related application manually. You can use the instructions that are provided in the manual removal guide below the article. If you have other unwanted apps in your system, you should terminate them as well. You are welcome to use the free scanner from our site to see if that is the case.